Budding Claptons should keep their eyes on the eTar, a sort of Internet-based guitar that’s designed to be used with the upcoming eJamming music service. 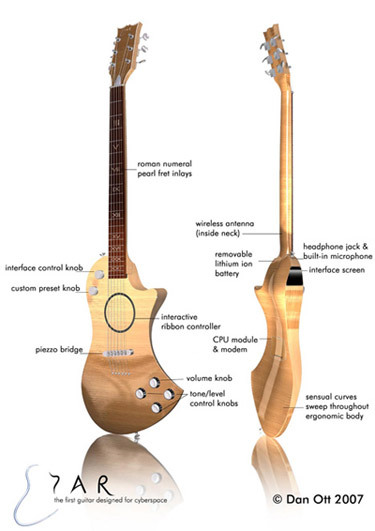 The eTar, which will make a real life apperance at a design fair in Britain in July, has all the features of a real guitar like strings and a volume control knob. You’re supposed to use it in tandem with eJamming, which lets you play music with someone else across the Internet. Like the site says, hook up with a drummer in Brazil, a bassist in Italy, etc. It’s the global village.